Thanks for taking the time to answer my email and for good advice. You wanted me to send another email focusing specifically on the right foot, which is the one causing me a lot of pain today. As I mentioned earlier, I’m 52 years old and my foot pain debuted in 2005 (in my left foot). However, the pan in my right foot began later – after I had surgery on the left foot in 2014. In my right foot, the Lisfranc is damaged because of arthrosis. I haven’t injured this foot, and I have never had any problems with it before. It’s painful when I walk and when I rest after walking. After a regular day at work, I often have so much pain that I have trouble walking. Also, I often experience muscle cramps in the calf and both over and under the foot. However, magnesium supplements have helped a lot with the muscle cramps. I have custom-made orthotics, but I don’t use them at present because they are uncomfortable in my Hoka shoes (they were originally adjusted to other shoes than the Hokas). Wearing the Hokas has actually relieved the pain a little and they are much better than other shoes I have tried. Contrast baths, as you recommended, also relieve the pain and I try to do them every day. In addition, I take extra vitamin D and calcium, as my doctor recommended this after I had a bone scan about a year ago. I use quite a lot of painkillers (tramadol and peracet with codeine, but no NSAIDS) to be able to work. I must mention, though, that some of these painkillers are for my chronic back problems, which I’ve had for over 20 years. I’m a teacher, and walking is thus a required part of my job. My foot has gradually worsened and become more painful during the last 3 years, and I now feel that the pain severely affects my quality of life. My orthopedic surgeon, who performed surgery on my left foot, strongly recommends surgery on my right foot as well. In his opinion, this is the only way to relieve the pain and get better. The surgery he would like to do is the same as last time – involving fusion of the 1st to the 3rd Lisfrancs. I’m scheduled for surgery in May 2017. My main question is if it’s possible to get better without surgery? Assuming, of course, that I would not have to take strong painkillers for the rest of my life and that my feet would be relatively well-functioning without doing the surgery. From your last reply, you seemed to think that there might be a chance to get better with conservative treatment. In that case, can you elaborate on what I would have to do – how would a potential treatment plan look like? 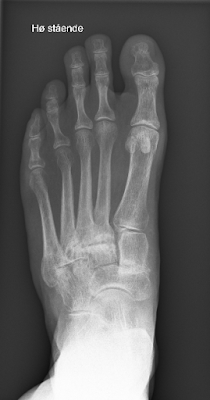 I would really appreciate your views on orthotics, taping, foot exercises, etc., especially if there are some things that are especially recommended for Lisfranc arthrosis. Due to my work, no weight-bearing at all is not an option. Alternatively, If I choose to do the surgery (again), how would a good rehabilitation plan look like? Last time (with my left foot), I had poor physical therapy – what should I look for in a good physical therapist in the rehabilitation phase? 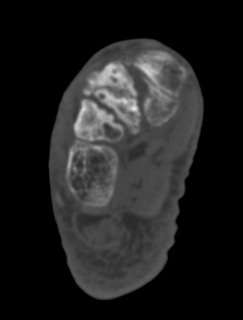 I attach x-rays and CT scans of my right foot only. I’m hoping you can help me, and I look forward to your answer! 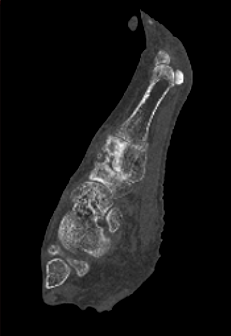 On this image, the arthritic changes are on the first cuneiform navicular joint, and the 2nd and 3rd met cuneiform joints, and possibly the 4th met cuboid joint. Dr Blake's comment: First of all, I am very sorry this is so tardy. I am learning electronic medical records for my office, and I have been in a 3 month fog!! Below I am attaching the excerpt from my book on Midfoot Arthritis which you definitely have to see if you are not getting any of the treatments listened. Definitely, the arthritis is extensive, so your surgeon probably is on the right track. So many patients however can avoid or prolong the need for surgery, so Golden Rule of Foot: Treat the patient not the imaging. I have seen too many of these do fine with orthotics, maybe a period of removable boots, taping, contrasts, even bone stimulators to strength bone are considered. So many of my patients develop midfoot arthritis as they age. 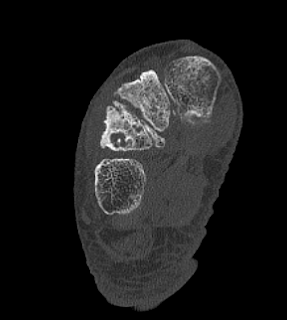 Golden Rule of Foot: Pain and swelling in the middle of your foot if you are over 60 or have had previous injuries to this area is midfoot arthritis until ruled out by MRI, CT Scan, or bone scan. Like any arthritis situation, it has both a conservative treatment side and a surgical fusion side. I have only had to recommend fusions to a handful of all my patients over the years. 4. Learn a daily form of tape from supportthefoot.com or Kinesiotape circumferential arch wrap. Daily until symptoms improve, then as needed, like with long hikes. 5. Removable boot, hiking boot, bike and hike shoe, or post op shoe when need to limit motion more. 6. Custom made functional foot orthotic devices with high arch support as a cast initially full time, and then just with activities more stressful. 7. Daily Foot and Ankle Strengthening forever. Go to Youtube and type drblakeshealingsole foot and ankle strengthening playlist. 8. Activity Modifications to create pain free environment, and build core strength and get cardio. 9. Physical Therapy or Acupuncture to reduce inflammation. 10. Occasional cortisone shots to reduce inflammation (the least as possible). I can tell how frustrating that would be because I have gone through that stage too. But i have taken a treatment from a certain professional which was really effective. You can look for more information in here copd & prostatitis treatment.